Eating healthy sometimes feels like a daunting task, especially when you run out of fresh ideas and just want something quick to grab and eat when you’re hungry (or hangry, let’s be honest). This is where a tiny bit of foresight and prep is your best friend. I know that if I have nothing healthy prepared in the fridge, I’m more likely to make the easier, unhealthier choice due to laziness and convenience. This is why, on a day when I’m already in the mode of cooking and I’ve taken out all my ingredients, I like to make a bunch of extra food to keep on hand for those moments when I’m famished and don’t know what to eat. This means, when you’re roasting, roast enough vegetables for four meals, not just one; or double that soup recipe for satisfying leftover in the days to follow; you get the idea. 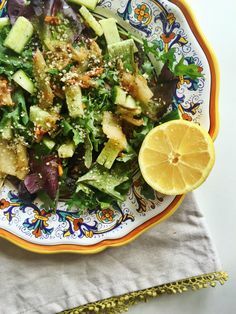 Here are a few staple recipes and items I like to have on hand because I know I can always throw them together to make a nourishing bowl of food. Preheat oven to 400 degrees F. Cut up one kabocha squash into slices, rub the flesh with coconut oil and sprinkle with some sea salt and a dust each slice with a light amount of cinnamon. Place on a parchment lined baking sheet and roast for about 20 minutes. Store in an airtight container in the refrigerator. Preheat oven to 400 degrees F. Wash and dry 3 sweet potatoes. Cut the potatoes into large wedges with the skin still on, I find that roasting sweet potatoes with the skin still on give you a crispier wedge. Toss the wedges in 1 tbsp of avocado oil (or another safe high heat oil), 1/2 tsp of sea salt, and 2 tsp of ground chipotle pepper. Roast for about 20 minutes on a parchment lined baking sheet. Store in an airtight container in the refrigerator. Wash one organic english cucumber and cut into thick slices. Dice up 1 or 2 avocados and add to the a bowl with the cucumbers. Cut half a red onion into thin slices and add to the mix. Drizzle with about 1 tbsp olive oil, sprinkle of sea salt, juice of half a lime, and 1 tbsp of dried mint. Toss everything together and enjoy. Preheat oven to 375 degrees F. Slice up 2 cups of mushrooms and add them to a parchment lined pan with 1 bunch of broccolini. Toss the vegetables in a mixture of 1 tbsp grapeseed oil, 1 1/2 tbsp tamari, 2 tsp sesame oil, 1 tsp rice wine vinegar, 1 tsp garlic powder, 1 tsp onion powder and toss together. Roast for about 15 minutes and top with sesame seeds. Store in an airtight container in the refrigerator. Chop up 1 bunch dino kale (or regular kale, I just prefer dino/tuscan kale) very finely and throw into a bowl. Mix together 2 tbsp tahini with the juice of 1 lemon, 1 tbsp olive oil, and 2 minced garlic cloves. Add this mixture to the kale and massage it with your hands.